Fresh Headies introduced a more cost-effective line of Bubble Bags, same top quality, but in a lighter fabric for the budget conscious home user. These bags use a medical grade, German made screen fabric for top quality extraction, only slightly less robust than our regular Bubble Bags. We were able to cut costs by manufacturing the nylon side walls with some variation in colour and weight, removing the draw string, and going with a more economical carry bag. The eight bag kit contains a work bag, one contaminant removal bags, and five crystal collection bags. It also includes two blotting screens and a carrying bag. The 1 Gallon Bucket is NOT included in this kit. Please order the Lite 1 Gallon 8 Bag Kit: with Bucket (BLS8-B) instead or add single 1 Gallon Bucket to your order. 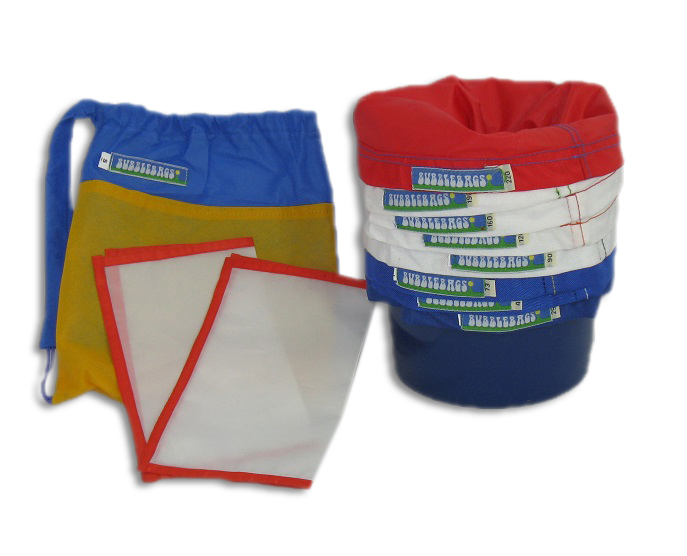 The 1 Gallon Bubble Bag Lite kits can process up to two ounces (dry weight) of plant material at a time. This kit is only suitable for processing small amounts for personal use.